As the leading manufacturer and supplier in this domain, we are engaged in offering a wide range of PU Leather Diary Covers. The given diary cover is high demanded inn corporate offices or used for writing personal things. This diary cover is accessible in diverse sizes and customized options so as to meet the needs of customers. Provided diary cover is designed using quality approved material in tune with modern industry defined norms. 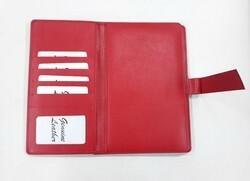 We are renowned as the flagship manufacturer and supplier of Red PU Leather Diary Cover. The diary cover is designed using quality proven materials and the latest techniques as per the market trends. In addition, this diary cover is customized in various designs & sizes as per the details given by the clients. We offer this diary cover at nominal prices in a given time frame. Looking for Leather Office Diaries ?